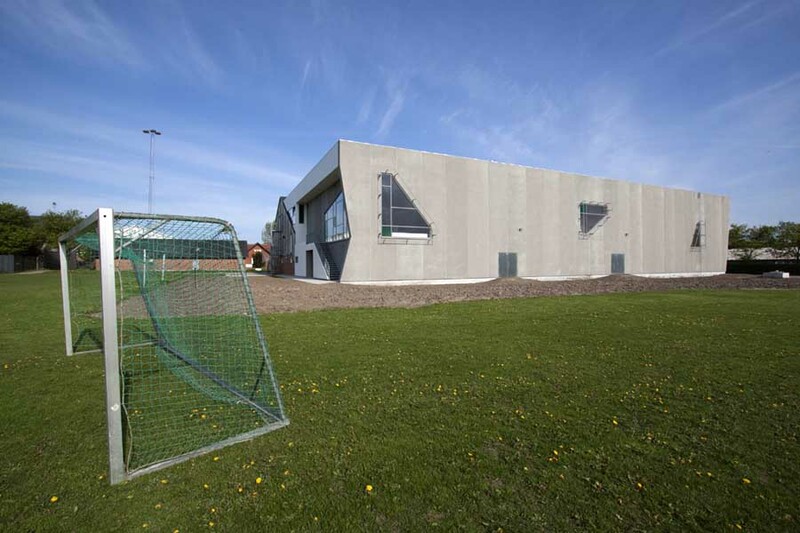 The children of Aarhus now have a unique hall to romp in. Aarhus Gymnastics and Motor Skills Hall, designed by C. F. Møller Architects, combines the best of the sports hall and playground and is the only one of its kind in Denmark – probably worldwide. 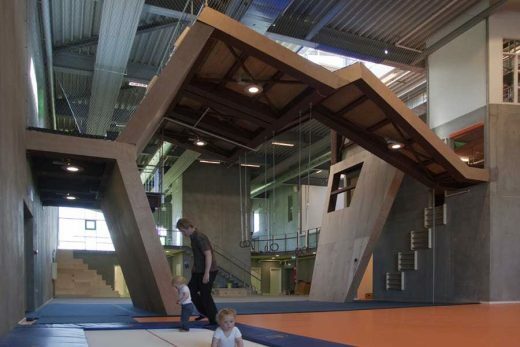 The Motor Skills Hall is an extension of the Aarhus Gymnastics and Trampoline Hall. The idea of the approximately 1.200 m2 of activity landscape is to invite and motivate children aged three to ten to develop motor skills while having fun playing. Possible future users of the hall are sporting associations, schools, youth centres, kindergartens, families etc. Normally, when designing a traditional sports hall, the layout is strictly guided by fixed requirements – such as court sizes, heights and widths. Here the challenge has been to creatively re-think the concept of sports and play, and create something completely unique. A sculpturally-formed climbing frame, called the seashell, rises in the middle of the hall. With its many sloping surfaces, holes and hanging ropes it calls to be investigated by curious boys and girls – the bravest of them can climb all the way to the top, three storeys up right under the ceiling, where a small glass lookout-tower discloses a beautiful view of Aarhus Bay and the nearby Mols hills. The unusual spaces which arise through the extension have also been put to active use; the slanting roof surface of the existing hall has for example been transformed into an indoor climbing wall.